The famous banyan tree, Tan Trao, a symbol of Vietnam’s independent struggle against France, has rehabilitated after a seven-year joint effort in the northern province of Tuyen Quang. The Tan Trao tree, named after the Tan Trao safety zone, has become a national historical relic, linked with poetry and music and instilled into the memories of Vietnamese people since the August Revolution in 1945. “The banyan tree Tan Trao has existed for around 300 years, so its image is seared into the memory of so many generations. Everyone here considers the tree a symbol of pride and cares deeply about protecting the tree,” said Tran Van Rao, an 80-year-old man living in Ca Village of Tan Trao Commune in Son Duong District. 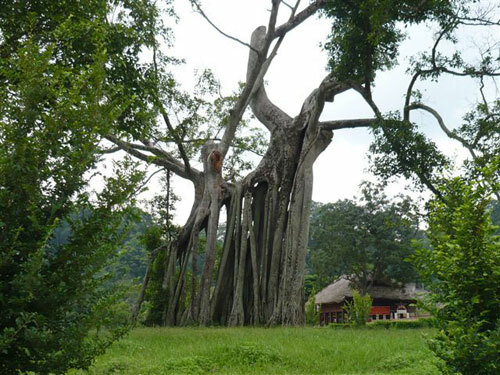 Lanh Thi Kien, a tour guide at the Management Board of the Tan Trao National Historic, Cultural and Ecological Tourist Area, said “the tree has witnessed many of the country’s significant historical events. Under this tree on August 16, 1945, the Vietnamese Liberation Army organised a dispatch ceremony in front of 60 delegates and General Giap read the No 1 military order”. Kien said the tree originally included two trees, one called “grandfather tree” and the other “grandmother tree”. In 1993, the grandfather tree was blown down in a storm, leaving only one small branch to survive, while the grandmother tree began to show signs of decay as well. In 2008, the tree only had one east-northern branch left alive, but barely, with all the main roots having rotted, prompting the province to consult numerous scientists to seek a solution to revive the tree. After seven years, the Tree is now back to life with huge leafy canopies and is under the care of the Management Board of the Tan Trao National Historic, Cultural and Ecological Tourist Area.